Who Thought Race Photos Were a Good Idea? What’s up with race photos? I just don’t get the concept – let’s take photos of you doing something highly physical, when you are at your maximum level of exertion. Where you are hot, tired and sweaty, with no makeup and wet, sweaty hair. Nobody looks good under those circumstances – at least I don’t! Perhaps they could do race day photos that are more like school photos. You know, where you get to pose before the race, in all your still dry gear, before your face is thirteen shades of crimson. At school, nobody wielding a camera came into class during a test to memorialize all those squinchy, concentrating faces. Nobody came by to try to capture you in the cafeteria with food crammed in your face as you tried to eat it all in 2 seconds flat so you could get excused for recess. Nobody snapped away while all the blood rushed to your head as you hung upside down on the monkey bars… No, instead you got to pose all pretty in your nicest outfit and pretend that you always looked that put together. Of course, even those posed school photos often went horribly awry. But there is a much better chance of looking good in a school photo vs. a race photo, statistically speaking. 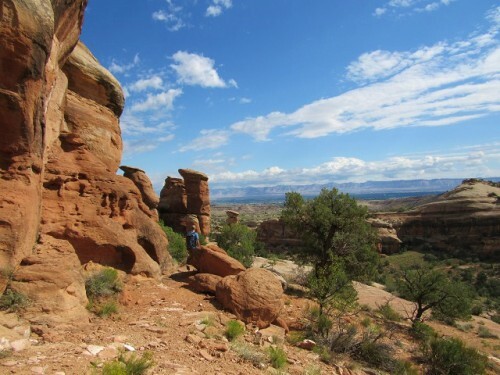 After lunch, we all hiked the Canyon Rim Trail, and the Window Rock Trail – a 1.5 mile round trip hike when you combine the two trails. We hiked along the mesa, with stunning views out over Wedding Canyon, with views of Monument Canyon in the distance as well. We saw more rock formations carved by erosion of the Kayenta Sandstone, watched several swifts race in the blue sky (say that 5 times fast! ), and marveled at the gorgeous desert landscape. 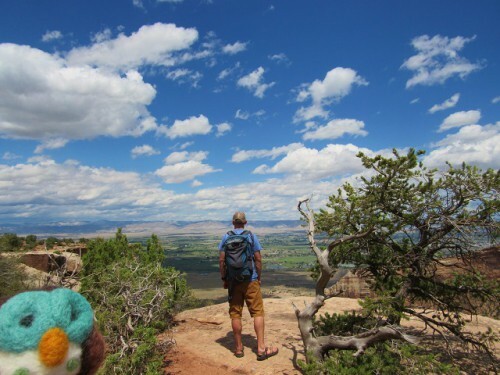 There is practically no elevation gain on this hike and no scrambling on slick rock, so it is a great hike for everyone (provided the kids are old enough to stay away from the edge). Wedding Canyon, with the Book Cliffs off in the Distance. After our second hike, I talked to a ranger and found out where we might see Desert Bighorn Sheep (near the Fruita, CO entrance to the park) and we headed that way with our eyes peeled. We drove very slowly along the road, peering up at the rocks around us. 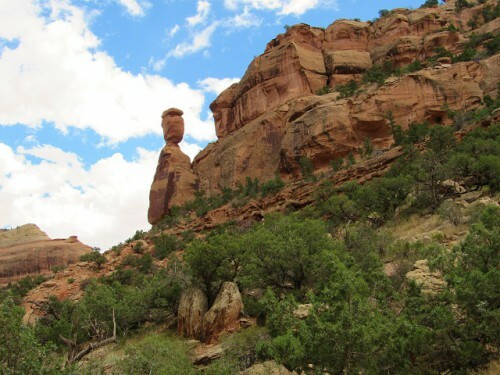 Sadly, we didn’t see any, but we did find “Balanced Rock,” which of course reminded us of Arches National Park and its more famous Balanced Rock. After Colorado National Monument, Jon and his Dad wanted to find someplace with access to the Colorado River. 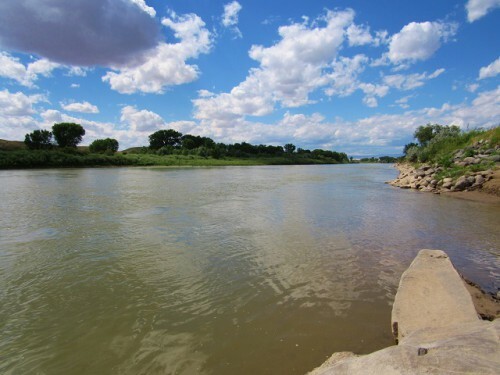 We found Colorado River State Park – it had no entrance fee that day, due to it being Colorado Day. I had no idea what Colorado Day is. We don’t have a Washington Day at home – what’s up with that? Upon looking it up, I discovered that Colorado Day celebrates Colorado’s entrance into statehood on August 1, 1876. We were there on August 3 though, so it is still a mystery to me… At any rate, the park gave us access to a boat launch where we could sit by the Colorado River (so we could say we did). It moved pretty swiftly though, so no swimming for us! We got a quick snack to tide us over for the drive ahead of us – just about 90 minutes to Montrose, Colorado, to be poised for the next day’s touristing. On the drive, we passed by a long string of train engines all hooked together – there must have been at least thirty of them! I wonder if they stash them there for the tough trips over the Rocky Mountains. I saw lots of Prairie Dogs or Wyoming Ground Squirrels, but they don’t really photograph well from a car traveling 60 mph! 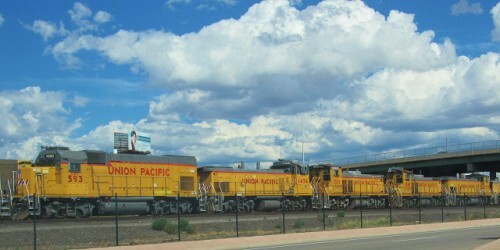 A line of Union Pacific train engines. And we had an early dinner at Himalayan Pun Hill Kitchen, a restaurant with Indian and Himalayan food – a seemingly odd restaurant to run into in small town Colorado. I had never had Himalayan food though, and we were all excited to check it out. The place was quiet – there was just one other table seated when we got there (but we were pretty early), and Jon and his Dad were making fun of how my choice would turn out. We each tried something different: I had the Chicken Sekuwa, Jon had the Chicken Saag, Linda had the Malai Kufta, and Robby had the Beef Sekuwa. 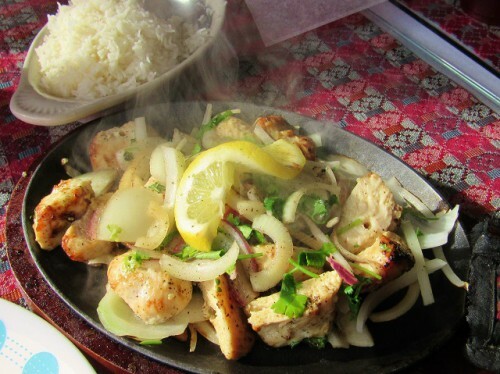 My Chicken Sekuwa was described as marinated overnight in a yogurt sauce and then flash cooked in a Tandoori Oven. We split an order of the Garlic Naan, which was lighter and crispier than naan I have had in Indian restaurants. Our meals were fabulous! They had lots of vegetarian dishes for Jon’s mom, and we all loved what we had – those of us meat eaters were able to try all of the dishes too! After dinner and checking into our hotel, we stopped in at a local liquor store to get some local beer and wine. I bought a bottle of the 2012 Plum Creek Riesling from Palisade, Colorado. Plum Creek Winery sources all of its grapes from Colorado, and has wines made from some grapes I haven’t seen before, Marquette and Freedonia, as well as some fruit wines. The Riesling had a nice, balanced sweetness with floral notes and peach flavor; a good everyday drinking wine – maybe one day we’ll be able to check out their tasting room. It was a great way to cap off a wonderful day. Hotel for the night: Super 8, Montrose – clean, but a little dated. Wrangling four people into a car every day is like herding cats. But we managed to all get going in the right direction and on our way to Colorado National Monument. Once we got there, we discovered this park is a feast for the eyes in all directions. 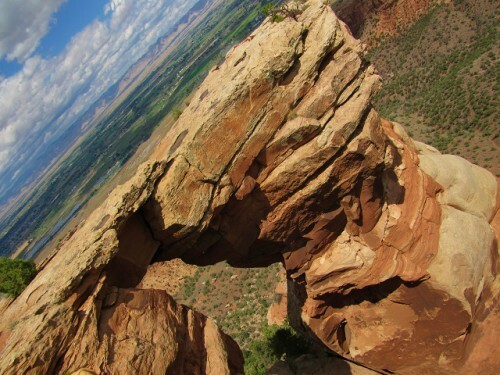 It reminded me of a combination of Arches and Canyonlands National Parks, both of which are beautiful! We stopped for our first hike at the first trail head after entering the park – Devil’s Kitchen. It is a 1.5 mile round-trip hike to the “kitchen,” a grotto created by four tall slabs of stone that encloses an area of slick rock on three sides. 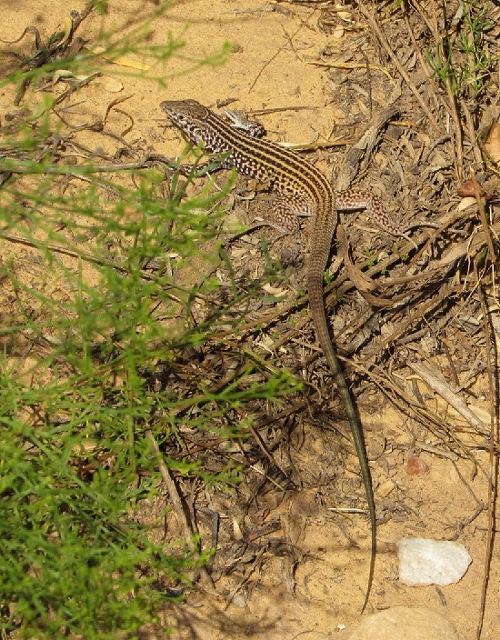 On our hike to Devil’s Kitchen, we saw two rabbits, several chipmunks, some small birds and several lizards. Jon’s parents hiked with us for part of the hike, and then turned around when we got to the slick rock climb. 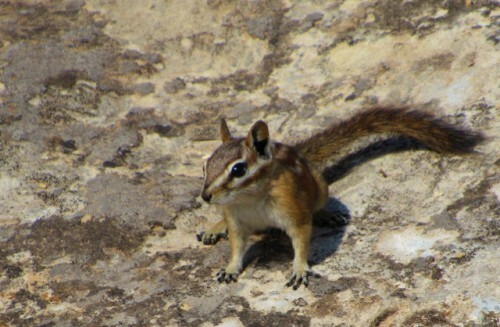 Chipmunk! They were everywhere in Colorado. Lizard! He was pretty big! About 16-20 inches with his tail, I would guess. Jon and I got a little off route trying to follow the cairns on the way up, so we actually passed the trail and made our hike a little longer and tougher, but in the end we enjoyed checking out the grotto. 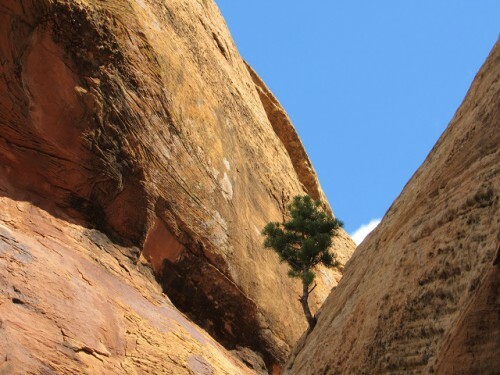 I was especially fascinated by the little tree that seemed to be growing straight out of the rock. Devil’s Kitchen is on the left side of the photo. This tree was literally growing out of the rock. On the way back I came upon a small group of people staring at the ground, so I told Jon to hike ahead to meet back with his parents, and I walked over to see what the staring was about. It was a very National Geographic moment! 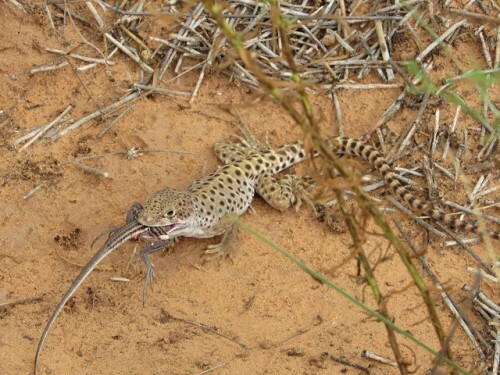 There was a spotted lizard eating a striped one! Not that I normally get all excited about the gruesome facts of life, but I suppose it has to happen. And if it does, I might as well get pictures. It was pretty cool (in a macabre sort of way, of course) to see. After the hike, we drove up Rim Rock Road to the top of the mesa and checked out some of the viewpoints. They offered fantastic views of the canyon below, where you could see riparian areas with cottonwood trees that were fed by seeps and springs. These would have been the areas where Native Americans lived all those years ago. 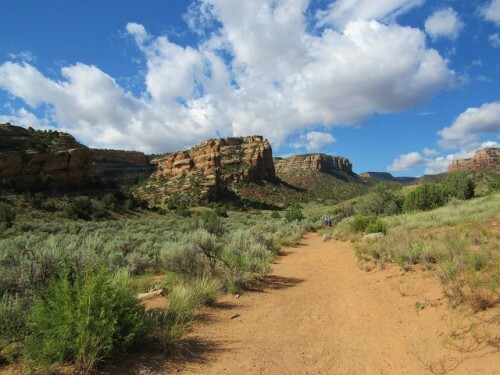 Today you can hike down into the canyon, or start your hike at the trail head before the road winds its way up to the top of the mesa. I loved the view of the Coke Ovens. They aren’t actual coke ovens, but a rock formation that looks like one. They kind of look like beehives too. We checked out the Kissing Couple rock formation – sadly no photo because someone (me) forgot to charge the camera battery. We also saw Independence Monument – John Otto and his bride were married here in June 1911 – she stayed only a few weeks before deciding she must have been nuts to sign up to live in a tent in the middle of nowhere. They officially divorced in 1912. If you remember from my last post, Otto was a big reason why Colorado National Monument came to be. He labored by hand for years, building roads through the monument to increase access – the main road he built is now a hiking trail – Serpent’s Trail. Next we headed to the Visitor’s Center for stamps and postcards, and they were kind enough to let me charge my camera battery too! We checked out the exhibits, and sat at one of the picnic tables outside to enjoy our lunch. We had to recharge for our next hike! Four days out from my half marathon, and I can mostly walk without soreness! I am still feeling my quads on stairs though. But of course, now I wonder if I’m getting a cold. What is it about a 40 hour work week that is just so long?! I just want to sleep in! 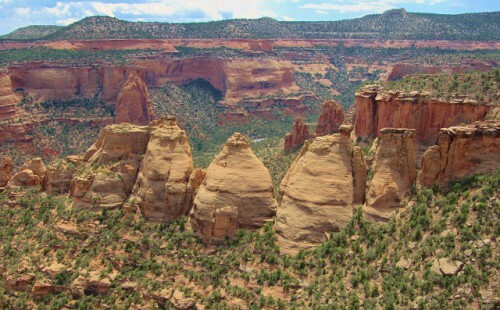 Colorado National Monument is an area of semi-arid desert and high mesa, with a large canyon running through it. It features several types of rock, including hard gneiss and schist (the gneiss is very interesting because it glitters), as well as softer sandstone that creates impressive rock formations as the powers of erosion do their work. 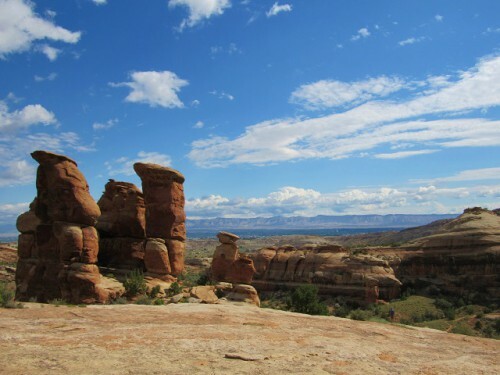 To me the landscape looks like a combination of Canyonlands National Park and Arches National Park. 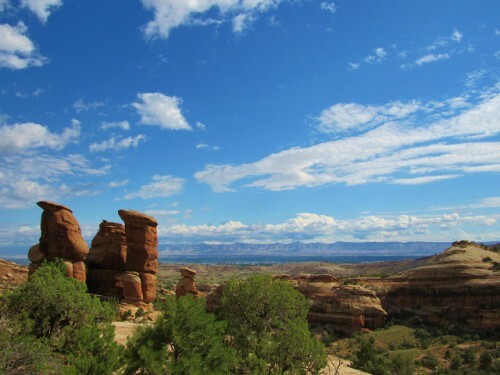 It has the red sandstone formations, and also the deep canyon with the juniper and scrub pine covered high mesa. 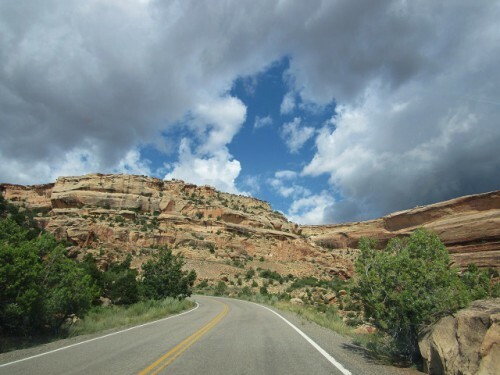 The land on which Colorado National Monument now sits was long thought by residents of nearby Grand Junction to be inaccessible, so there wasn’t a lot going on there until John Otto arrived in 1907. He began building trails through the area, up to the top of the mesa. Otto’s work eventually got the notice of the locals. 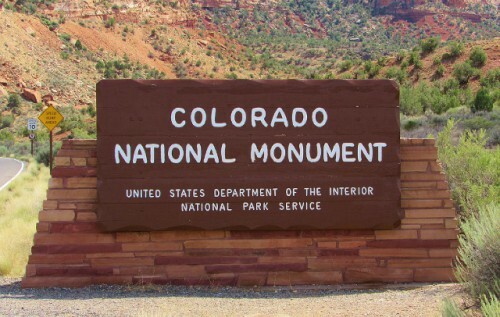 They decided to lobby for national protection, and Colorado National Monument was designated on May 24, 1911 by President William Howard Taft. Devil’s Kitchen in Colorado National Moument. Visitors today can drive the 23 mile Rim Rock Road, which was begun in 1931 and constructed by the Civilian Conservation Corps, mostly with hand tools! It starts near the bottom of the canyon at each of the entrances to the park and climbs quickly up to the top of the mesa. There are 40 miles of hiking trails, several of which descend into the canyon and take hikers to some of the stunning rock formations. The longest hike in the monument is 14 miles. Hikers looking for an easier trek can hike along the canyon rim. 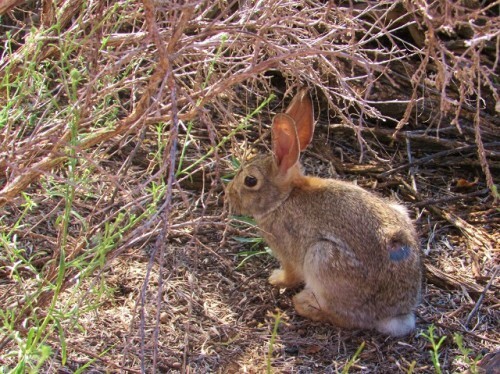 Wildlife includes several species of lizards, rattlesnakes, scorpions, coyote, squirrels, rabbits, Golden Eagles, swifts, and Desert Bighorn Sheep. Did you know that Desert Bighorn Sheep are actually a separate species from Rocky Mountain Bighorn Sheep? They have adapted mechanisms to conserve water more effectively than their mountain cousins. 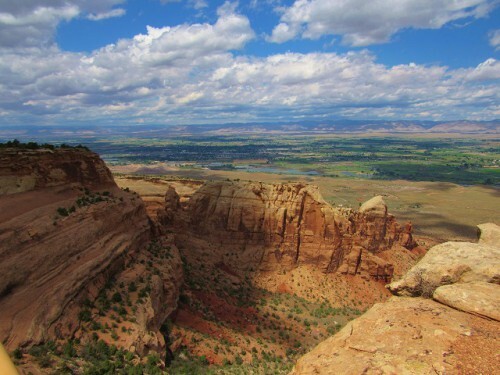 Did you know that Colorado National Monument once had bison? At that point shortly after the turn of the last century, bison were still very close to extinction. John Otto raised money to buy one bull and two cows from Yellowstone National Park in 1925. They multiplied to about 45, and the herd was periodically culled to keep it within a manageable limit for grazing. However, they were fairly destructive to the fragile high desert ecosystem, so they were removed in 1983, and taken to Badlands National Park. 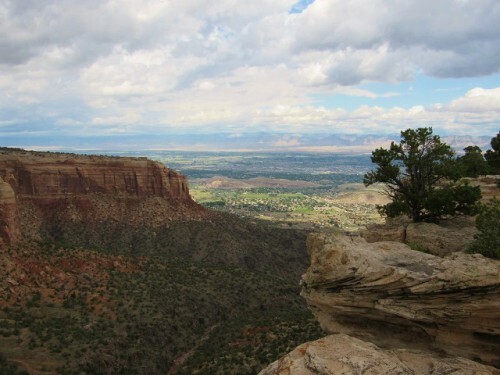 There were 454,510 visitors to Colorado National Monument in 2012, and the park encompasses 20,533 acres, much of which is undeveloped backcountry. I’ll take you there next! I have asthma – adult onset, exercise induced. I am not fat, and not thin – just average. I’m short. I was never a runner. I pronate severely (my feet roll inward when I walk), and have struggled through the pain of shin splints several times. And a few weeks ago, I turned 40. Yet despite all this lack of athleticism, this morning, I completed my seventh half-marathon. 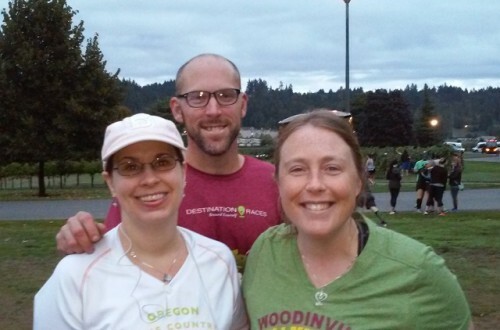 It was the inaugural Woodinville Wine Country Half-Marathon. In that month, I did exactly one 8 mile walk/jog. And the usual couple times a week 4-5 mile walks. I didn’t feel prepared. I figured I would be happy just finishing, and wouldn’t worry about my time. This morning, we drove to the race, and started a few minutes after 7. Jon started near the front; Katie and I lined up at the back. We stood next to the 3 hour pace runner, but I had no expectation that I would do a 3 hour race. A shin splint was bugging me early on, before settling down in the second mile. The 3 hour pace runner passed me. But then I passed her; and pulled away just a little bit. And as the miles ticked off, I was still just a little way ahead of her. I began to second guess – she must be setting the wrong pace. She must be running too slow for a 3 hour finish! I stayed ahead. I never really let myself believe that I was really doing so well. Between mile 5 and 6 I first started to notice the blister on the bottom sole of my right foot – it hurt more when I jogged, but I kept pushing myself to jog for periods of time. Between mile 8 and 9 keeping up my intermittent jogging was getting really hard. Between mile 10 and 11, I started to think that my music was really annoying, and the sooner I finished, the sooner I could turn it off! Mile 11 was the longest mile ever! When I hit the beginning of mile 12, I looked at the clock and realized the pacer might be right. I thought I would finish just a few minutes past my best time ever. I tried to keep up my pace. In the last tenth of a mile, rounding the curve, and seeing the finish clock, I realized I was really close to my personal record – I could beat it! I found just enough gas at the end to sprint (my sprint – which is pretty slow) across the finish line. Jon had finished almost an hour and a half earlier, and he was waiting at the finish for me, to cheer me on. I didn’t know if I had beaten my previous record until hours later when the official times were posted. But I did! My finish time, and my new personal record, was 2 hours, 56 minutes, and 23 seconds. I trimmed 18 teeny, tiny seconds off my old record. But in doing that, I also trimmed off a big chunk of self-doubt, the kind that says, “You are 40 now – it is just downhill from here.” I got this! In my last point – I shared our experience driving the Trail Ridge Road up to the Alpine Visitor’s Center. Now, we hustled back down the hill from our hike above the Visitor’s Center to some big, fat raindrops, but fortunately the skies didn’t really open up. Back in the car, we made our way down from the higher elevations, passing by the Continental Divide (we didn’t stop because we couldn’t find a parking space at the viewpoint). 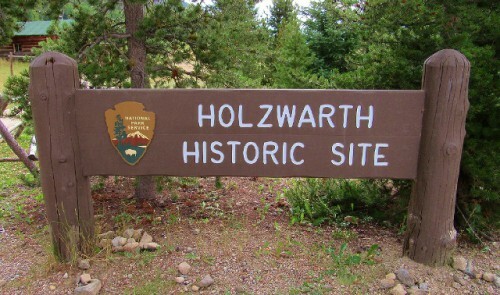 We did stop at the Holzwarth Historic Site. It marks the site of a homestead and later tourist holiday and dude ranch located in the Kawuneechee Valley along the Colorado River. 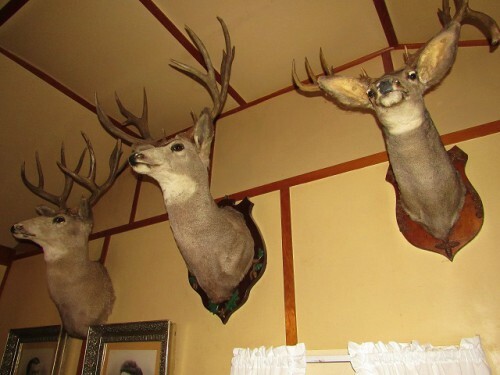 It was operated by John and Sophie Holzwarth, who came to the area in 1917 after prohibition was a major setback for John – he was a saloonkeeper. The family decided to try their hand at subsistence ranching. The ranch never really took off, but in the 1920s, the ranch opened to tourists, who could stay there for $2 per day or $11 per week. 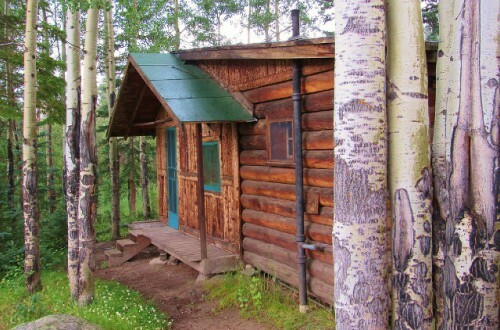 For that price, you received 2 meals per day – Sophie Holzwarth was said to be an amazing cook – and lodging in a rustic cabin. We walked about ½ mile through an open field to the site, crossing a Colorado River that is still more of a mountain stream so close to its headwaters. The clouds above were continuing to look ominous, and we felt more of those big, fat raindrops. 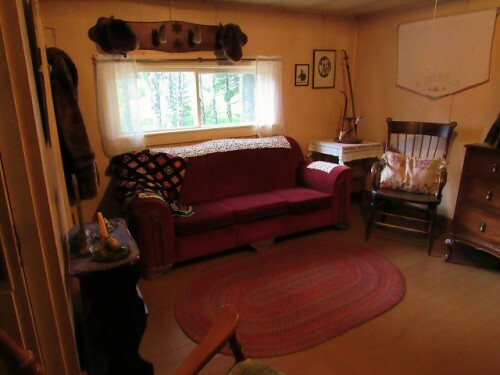 We arrived at the site just in time to beat the rain and catch a tour of the main cabin, called Mama House. John and Sophie also distilled their own liquor in a homemade still – a big draw for their guests. Apparently they were busted once during Prohibition, but the feds really had bigger fish to fry, so they were mostly left alone. At the end of the tour, the kids had an opportunity to try on a bearskin coat (like in Legends of the Fall!). 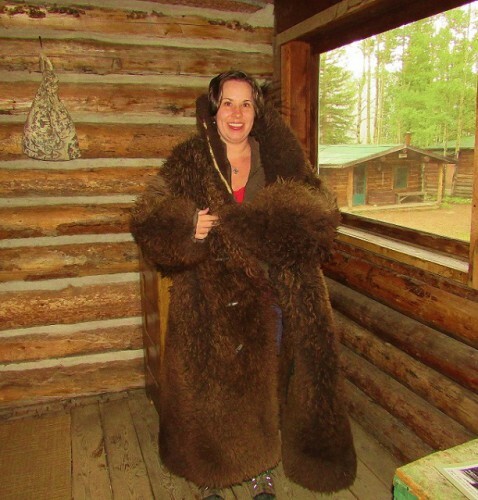 I couldn’t resist – after the kids cleared out I tried on the bearskin coat myself – it was really heavy and really warm! We also checked out several of the other buildings onsite, there were several small cabins for the people staying at the ranch, the icehouse, and the taxidermy shop. They were all pretty cool. The rain was really coming down at that point, and I was standing outside a cabin, under the eave, wondering if the rain would stop and chatting with the Ranger. He explained that if lightning and thunder began, we could get a ride back to the parking lot. Three people have been killed by lightning this year in Rocky Mountain National Park, so they aren’t messing around. If there is lightning in the area, they don’t want you walking through a field being the tallest thing out there, because then you are a target! A few minutes later, we got to ride in an official National Park Service vehicle, and I didn’t even have to get myself arrested! Our next stop was impromptu – we saw cars parked along the highway and knew something was up. What we didn’t know was that the something was two moose! I saw moose! They were just off the side of the road, so we got a great view of them – it was awesome! I know this is a lot of exclamation points, but it was so cool to see moose in the wild! 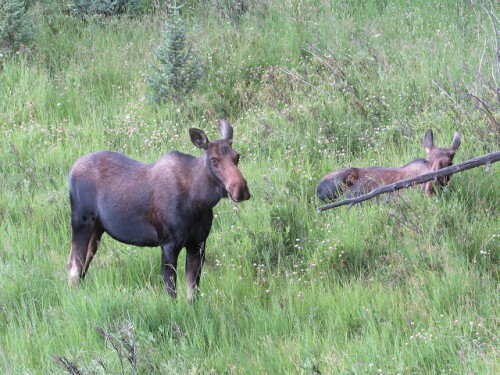 The moose were just relaxing quietly near the river, one was lying down and the other was standing. I think the one lying down was a yearling, still hanging out with its mother. 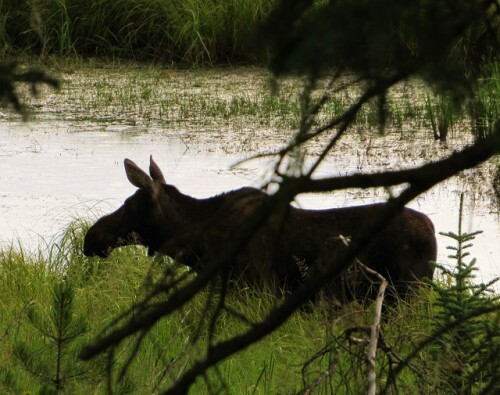 After a short time watching the moose, we got back in the car to get on our way, just as the rain was catching up with us again… This time we were in for a long evening drive to our destination for the night – Grand Junction, Colorado. We arrived after dark, after a long drive through road construction, alongside beautiful rivers, and past turnoffs for resort towns like Vail, and I saw another marmot in the middle of the median of the freeway – very much alive! Hotel for the night: Econo-Lodge, Grand Junction – clean and bright with large rooms!